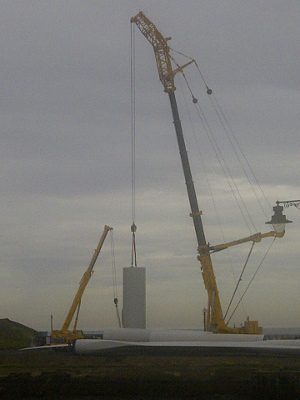 Over the past week we have been watching the construction of a new REPower 3.4MW wind turbine for Hainsworth Energy. It has been an incredibly impressive event to watch, as after two weeks of preparation the whole system was put together in four days. The system will be commissioned at the end of September. Projects such as these help protect the UK from the global energy prices and help combat anthropogenic climate change. The National Renewable Energy Centre, Narec, is part of a £1.9 million European Regional Development Fund (ERDF) investment project designed to deliver a funded programme of business support and skills development to North East based SMEs (Small Medium Enterprise), with the aim of encouraging companies to expand or diversify into the microgeneration and low carbon technology market. SMEs will have access to support from Narec’s expert team of Distributed Energy specialists who have a wealth of industry experience, in-depth knowledge and technical competency in renewable technologies and their installation. Bespoke training packages can also be designed to meet individual and organisational training needs. This project will be of particular interest to plumbers, electricians, roofers, joiners, heating engineers, sales professionals, architects, planners and specifiers, who have an interest in working in the microgeneration and low carbon technology market. If you are a sole trader or qualify as a Small Medium Enterprise (SME) and would like further information on how to benefit from this funded training and support please contact Andrew Tipping, SME Engagement Coordinator, Narec Distributed Energy. 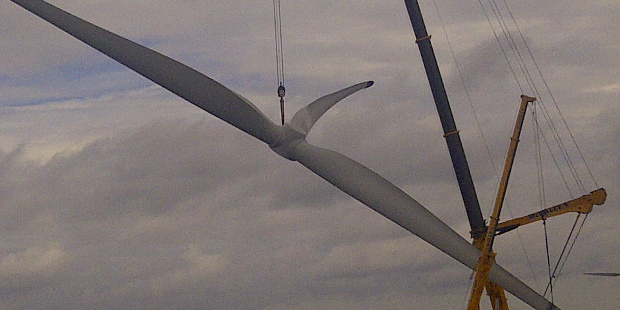 Between January and March 2012 Narec Distributed Energy provided two days of technical support and advice related to the offshore wind industry to 14 companies in Middlesbrough. Middlesbrough Council commissioned Narec Distributed Energy to undertake a free ‘renewable audit’ with engineering companies in Middlesbrough to identify the potential for the engineering sector within Tees Valley to service the offshore wind market. The audit was carried out to assess the feasibility of adapting and accrediting products and/or services for the offshore wind industry. The support culminated in a written report based on the findings as well as an overview of the UK offshore wind market which identified their position within the supply chain. The document also provided details of opportunities and potential future activity, along with conclusions and recommendations as identified by Narec Distributed Energy staff.